As enterprise data sources are becoming increasingly decentralized, the shortcomings of cloud-based architectures tend to rise to the surface. With typical network cloud systems, data is pushed up to a server and then pulled back down by clients. This works well for videos, pictures, music, documents and non-critical applications, but is not a good design for realtime IIoT data. If data does not reside at the source, the data quality may be unreliable. Issues with the freshness, accuracy of data, and speed of delivery are potentially impacted when using a cloud architecture. When supporting a complex IIoT solution, a centralised cloud architecture becomes costly in terms of bandwidth cost and computing resources. Latency and network availability issues also impact cloud based IIoT. Technicians working on a remote wind turbine use edge computing to view basic data and analytic information in the field. The essential data needed to diagnose the turbine is more efficiently delivered in the field without having to rely on patchy cellular communications with a cloud based solution. 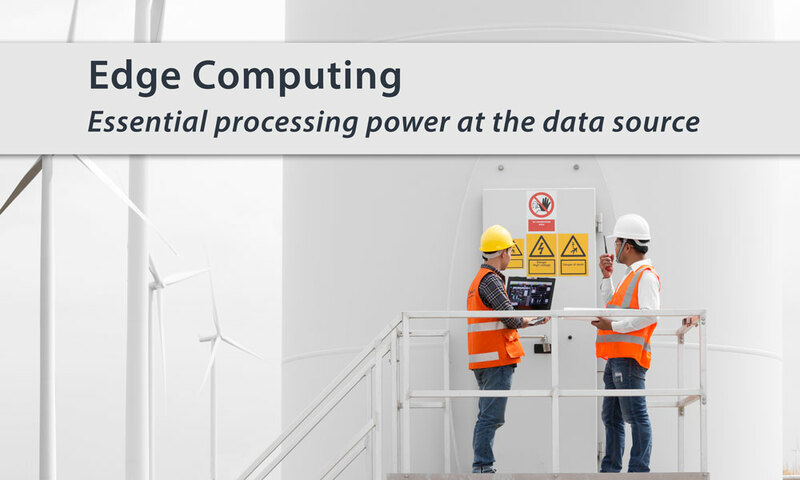 Processing power is provided at the data source or ‘edge’ via standard PC hardware or other IIoT gateway devices. The centralized cloud platform is still utilized for more resource-intensive analytics, stored business logic and data warehousing. 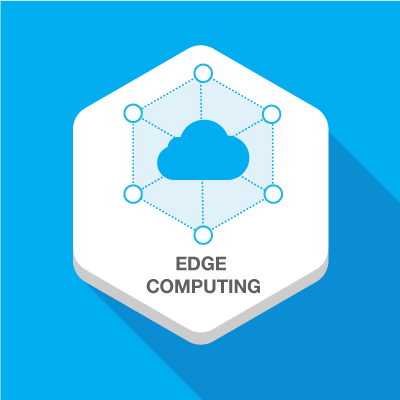 The business case for edge computing is driven by cost savings in computing power and bandwidth as well as its ability to provide faster and more accurate access to automation data at its source. For many IIoT applications, edge computing is the reliable and cost-effective way to ensure data quality, freshness, accuracy and speed of delivery. 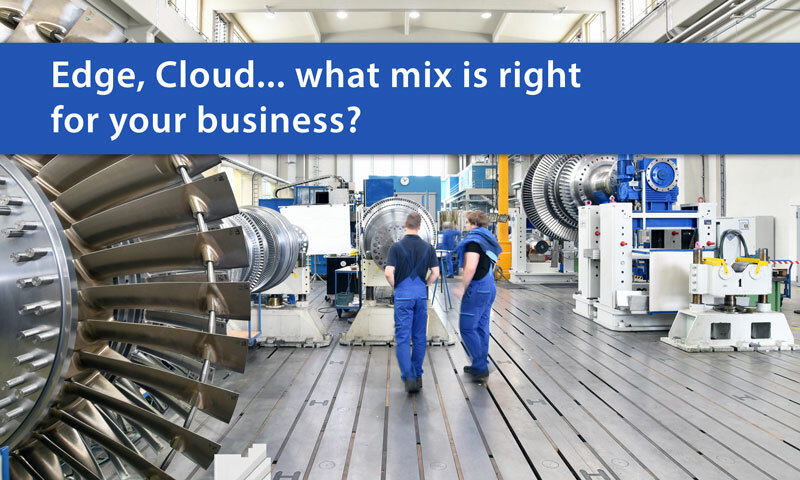 Other factors such as the quantities of data transferred and bandwidth costs will determine the ultimate mix cloud and edge services. Which network architecture is right for your business? 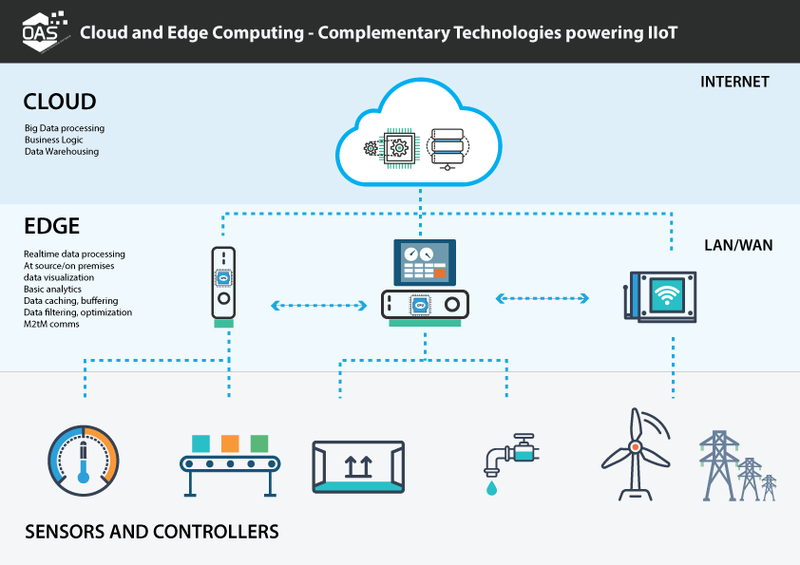 Edge computing and cloud computing are complementary architectures that come together to create powerful IIoT platforms. One does not replace the other. The best IIoT solution for your business will likely be a mix of the two architectures. Deciding which computing tasks should happen in the cloud or at the edge requires careful analysis of your business needs. Software providers like Open Automation Software are ideally placed to provide the software infrastructure for creating a world-class IIoT solution as well as providing advice on how to best design your edge computing platform. 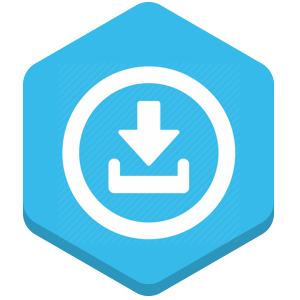 Download a free trial of OAS – start building an edge computing solution!